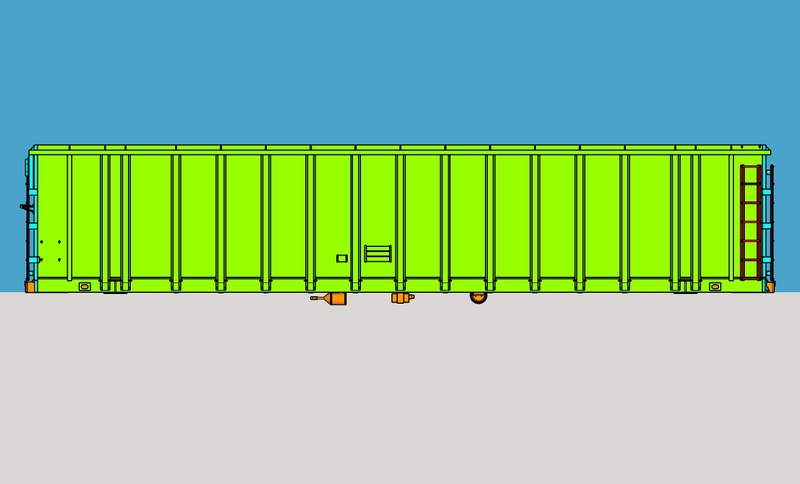 I started drawing CN woodchip car decals today. I thought it would be harder, but thanks to CNRHA sets of CN fonts, it made my life easier. 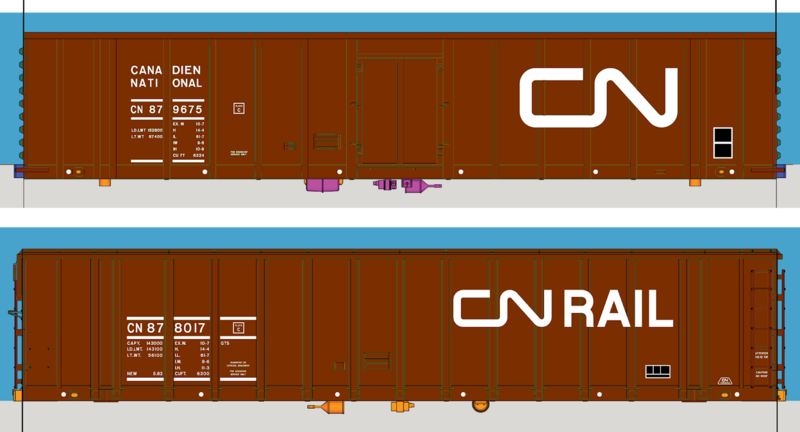 CN logo was redrawn from specifications. It is not a scale down logo from the web. Artwork was drawn directly in 1:87. All artwork was done redrawing over actual pictures. I still have to do complete the lube plates and some lettering on the ends, but it shouldn't be to hard. Interesting notes, when drawing the decals, I spotted a few discrepancies between my model and the prototype. 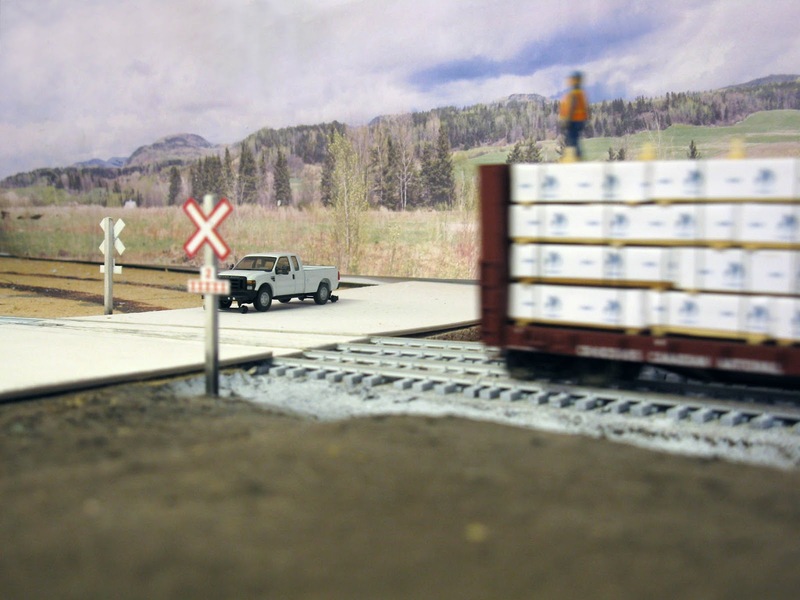 CN 878000 tack boards should be further left and CN 879000 has a slightly fishbelly sill. I'll improve my model before production run, however, I'll have to alter the prototypes which are actually being printed. 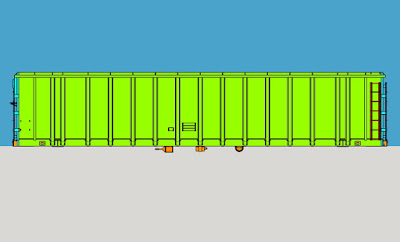 Over the last week, I've reworked my prototype of CN 878000 (CN RAIL version) woodchip car. 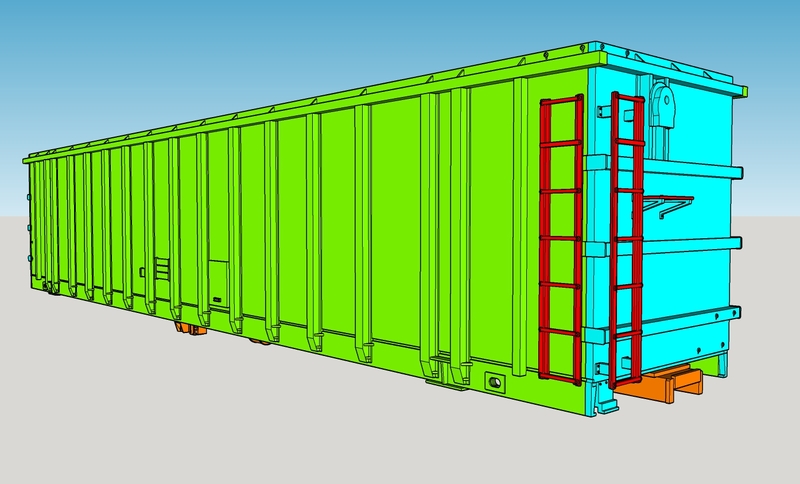 The original 3D model was done about 5 years ago and it was time to upgrade some details and set the bolster and coupler pocket at the right height. I'm kind of happy both models are now done and they will soon be printed. When assembled, I'll be able to make some fine tuning before going forward with production. Still a lot of work to do, including drawing the photoetched parts and making decal artwork. I suspect I have probably a good month of work in front of me. Meanwhile, I've discovered some discrepancies between my model and the prototype while reviewing pictures for artwork purpose. It seems series 379000 cars had fishbelly sills. Almost unnoticeable, but once you see it, it can't be undone. I'll have to rework the 3D model accordingly. I've yet to decide how much cars will be produced and I'm still trying to figure out the market for such a kit. So far, I know it would be safe to produce a 50-car run for each car, meaning a total production of 100 cars. Cost wise, it would be the threshold to optimize prices. Another option is doing a 250-car run for each prototype. 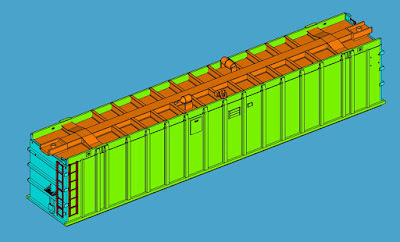 Kits would feature better detail and a one-piece body, limiting assembly to adding details. From a cost perspective, I could get better prices, meaning the model could be sold at a decent price. It also means modellers would have an easier time building the cars, making it much more attractive. As for decals, it seems the cost would be about $7,50/car. I would love to bring that price down if possible. That said, if I'm choosing the semi-industrial route it could be possible some crowd funding would be required. It also means a lot of work on my side to prepare each kit in a decent manner. At this point, it is no longer a hobby, but almost a job, including business risks. Whatever my final decision regarding the production details, I expect the total cost for a kit being between $45 to $50. It may sounds a lot for some people, but that's about the price you must expect when buying crasftsman resin kits. Given it would include trucks, decals and most details, I suspect it wouldn't be a bad deal at all. 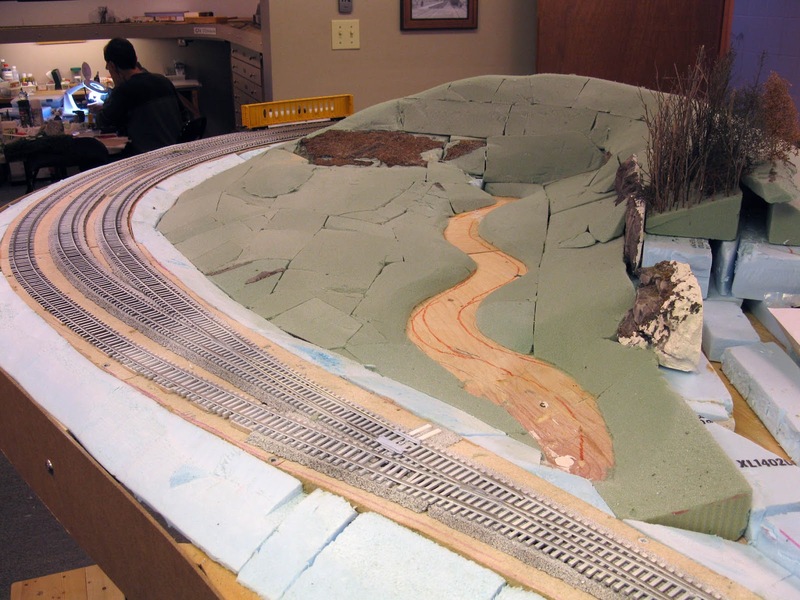 Most people must be astounded how slow we are setting the landforms on the layout... It's been more than a month and while we worked every Saturdays for several hours, very little tangible results can be seen... or this is what you could believe. Scenery is a mysterious thing. Really, this is probably one of model railroading most challenging aspects, at least the most artistic in nature. It means that not only you need a decent mastery of various techniques, but you have to make extremely subjective choices that no one else can make for you. 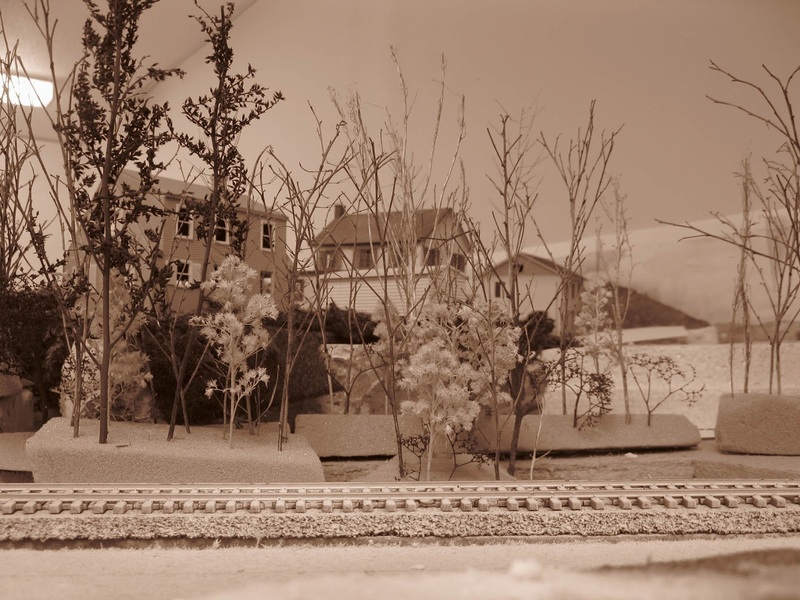 Replicating a scenery to the perfection is rarely an available option and thus, you can't escape long sessions trying to figure out how elements can be put together in a different way while still being relevant to the emotion you want to transmit. First, why emotion? 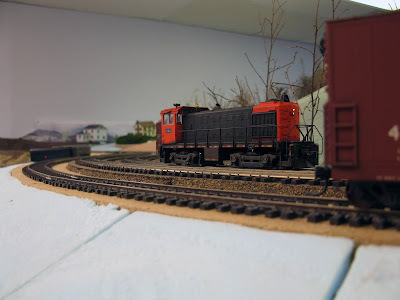 Model railroading is, in a large part, a matter of emotion and sensibility. Every railfan has a particular and very personal interaction with trains that define a set of emotions that makes him develop a passion. Most of the time, these emotions are hardly defined and are subconscious in nature. However, take them away and the hobby come to a stall, just like a locomotive losing its priming mover. 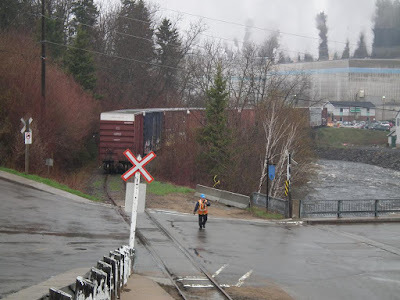 An interesting thing is how many fans of trains will start to see beauty in industrial, rundown and rough environment and machinery. 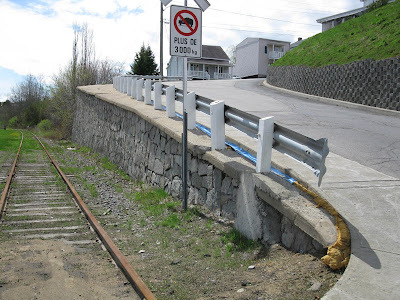 I'm not just talking about the sheer enjoyment of mechanics, but truly how rust, faded paint, oil spills, under-maintained structures and less than optimal landscape can gain an artistic value by themselves. That is truly the beauty of this hobby, how we can transform a pile of vile things into gold. For this reason, having a clear vision for Clermont takes time. 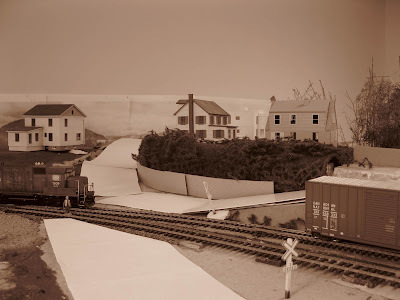 We have made a small mockup a few week ago of how the 2 slopes converge toward the railway track and have been spending many hours looking at it, trying to improve the look but also the vibe we can get from this scene. Less houses better frames the vanishing road. A key ingredient has been to not rush the process. When in doubts, we leave it alone and come back a week later. Last Saturday was interesting. When the session started Jérôme simply said: "I know you'll hate me, but I feel the scene is too much crowded but I can't pinpoint the specific reason." I then removed a house and replaced it with a small garage... Bingo! The visual balance was restored and now, the structures and roads worked perfectly bring creating a real scene of depth and perspective. If we had rushed, we would have never seen it. Another nice discovery was when I looked at my pictures today. I had shot a consist passing behind the old shed at Desbiens Street without specific goal if not experimenting a new angle to frame my subject. To my surprise the new lower ridge in the middle of the peninsula made Donohue's smoke stacks visibile in the background through the tree line. Without knowledge, I had achieved "shakkei", that Japanese visual concept of reusing and stacking together distant and unrelated objects to create depth to a composition. What should have been a 16 inches shelf became instantly a 1 km deep panorama telling a story. Donohue is indeed visible in many part of Clermont and achieving this was pure serendipity. If we had not removed one house a few hours before, we wouldn't have achieve such a thing. Another lesson learned was that a relatively low central ridge separating each side of the peninsula doesn't make immersion into the scenery less efficient. When operating yesterday, it was clear our eyes were mainly focussed on the right of way and everything outside blended together nicely. We thus feel having to create an opaque barrier between scenes isn't required and could, in fact, remove the depth we discovered by chance. 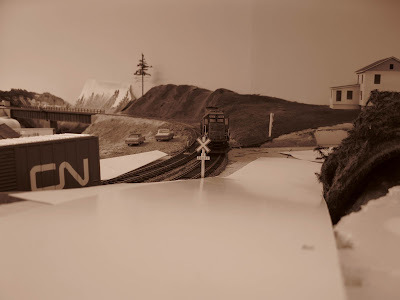 I'm happy to announce the CN Woodchip Gondola project is not dead and well alive. Thanks to Justin Babcock, I've been able to refine my 3D models to a level I feel is quite excellent. Now it's time to adapt this quite accurate model into something that can be both printed and cast as a resin kit. 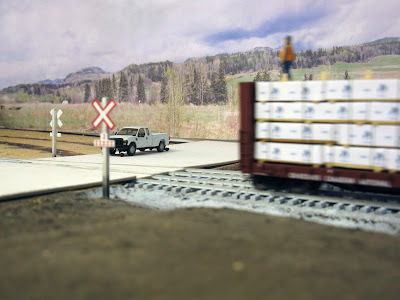 Jeff Briggs from Briggs Models has been helping me to figure out how we could realistically make it possible in HO scale. I also want to thank Bruce Barney who kindly gave me many hints about improving a model for 3D printing. 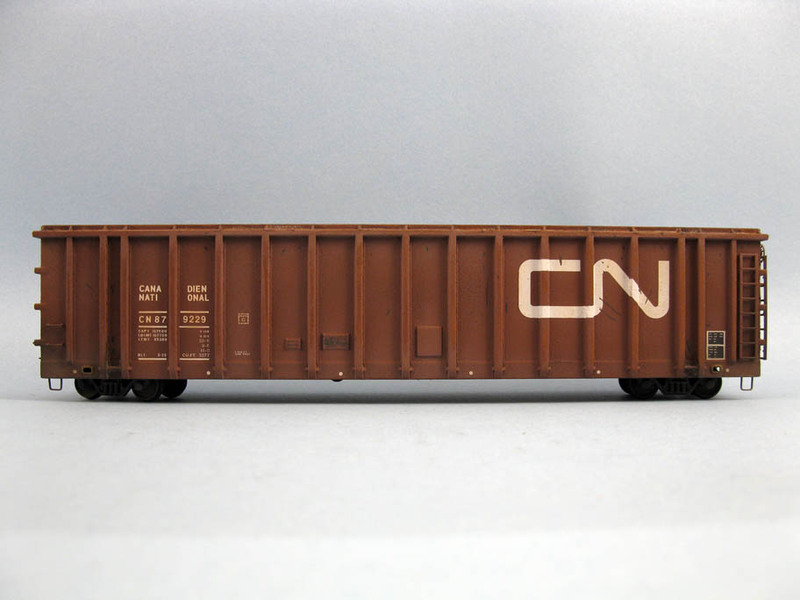 The first model to go into production would be CN 878000-series. It was the car with the side doors welded shut and lettered with a standard CN wet noodle logo. 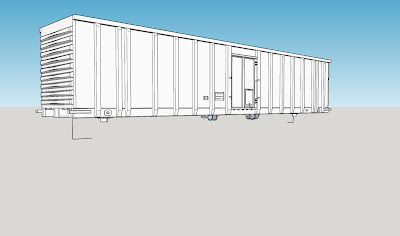 The kit would features flat parts (sides and ends) and a one part underframe. Small separate details such as brakewheel, air reservoir, valve, etc. would also be supplied. 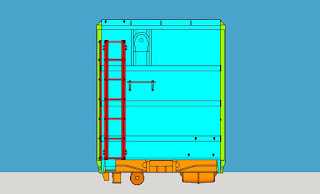 A standard coupler box made to accept most Kadee products would be cast on the underframe. Ladders and platforms would be photo-etched brass and grabirons phosphore bronze. Due to casting process and price control, the underframe would feature all the structural members of the prototype, but they will have simplified cross-sections. Since these car sills are quite low, such details aren't visible and I think most people can live with that limitation. However, everything visible would be detailed as best as I can. 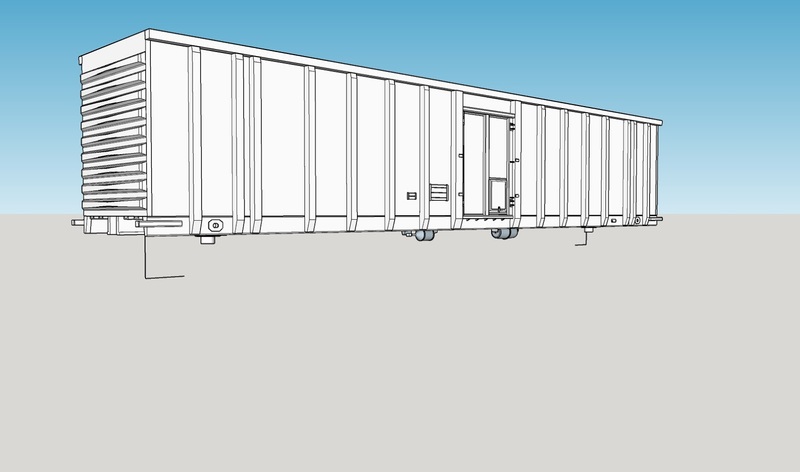 Kit won't be supplied with trucks, but it is good to know Rapido is making the correct Barber S-2 100-ton trucks used on the prototype. The model was designed with them in mind. For rivet counters, I could put on Shapeways the fully detailed underframe to 3D print. 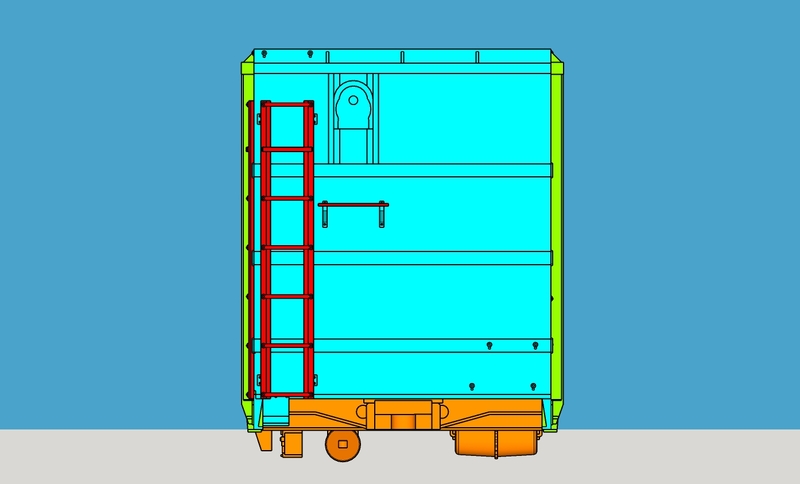 This underframe would fit the resin kit. Be only aware it will cost a lot. Also, I'm working on CN 879000-series (of "CN Rail" fame). A set of decals will be produced for these cars. I still have to contact a trusted decal makers (if possible Canadian) and produce suitable artwork. Feel free to suggest names. Price will vary from $30 to $40 per car depending on quantity produced (based on 25-car and 50-car runs). I can be said the initial run would probably be at least 50 cars. For this reason, if you are interested in this project, let me know how many cars you would like to have. This will give me a decent idea how much cars to produce. Feel free to leave a comment, contact me on Facebook or via email at matlac@gmail.com. (you can contact me or leave a comment). Clermont - How to Recreate a Complex Scene? After completing topography around the small creek, we have now moved on one of the biggest scenic challenge on the layout: Clermont itself. This scene has been a headache since we decided to include it more than 4 or 5 years ago. The reason is simple: space is lacking, track is curving inward and the scene is mirrored. Given these limitation, it is really easy to overcrowd the area and get a cute little Walthers Catalog village. Not exactly what I have in mind! Back in the days, we dodged the issue by creating a bogus scene that caught the spirit of the place but was quite nondescript. Now, it's time to figure out a way to make things slightly more prototypical. 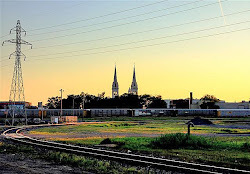 Clermont is complex and can be divided in a few key elements that gives it its personality. First, the grade crossing is located at a complex road intersection where two steep roads converge. 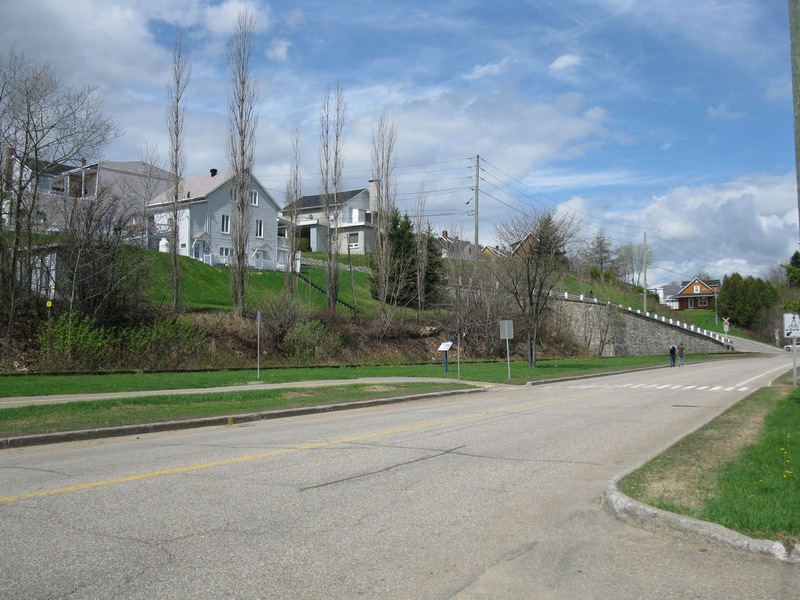 It results in a very large expanse of asphalt. 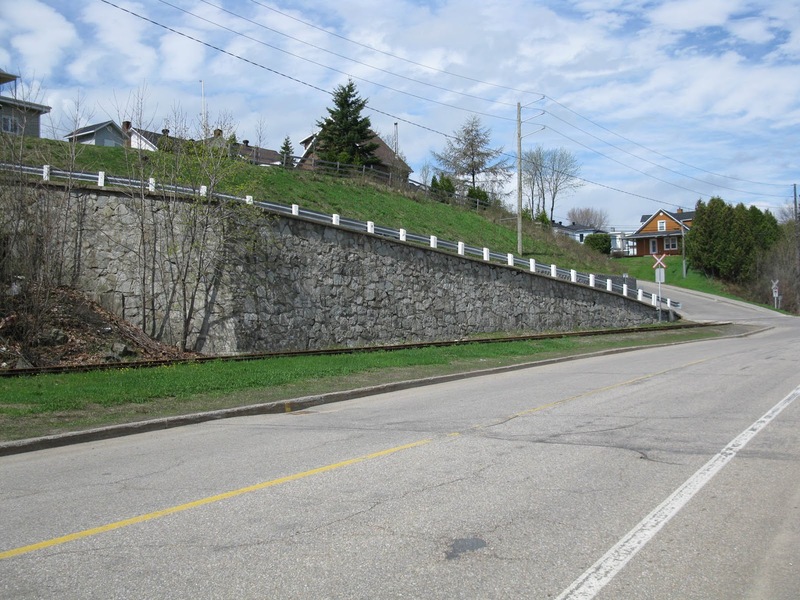 Second, a large stone retaining wall is located against the tracks and create a prototypically clearance issue. Third, a few working class houses are high perched on the hills, hinting at a small industrial town over there. To conspire against these characteristics are the peninsula limitation. 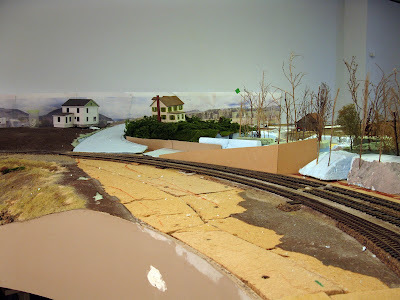 There is about 1 feet of scenery available to work out a road between both tracks there. Not exactly the best place to make a road disappear seamlessly into the woods. Can we manage to do it? Maybe. At least, this partial conclusion was reach after a 5 hour long brainstorming session last night. After several tries, we concluded the main road should follow the previous road alignment that we built years ago. The reason is simple: it is the only place where your eye is naturally drawn to the scene. Otherwise, it will look weird. 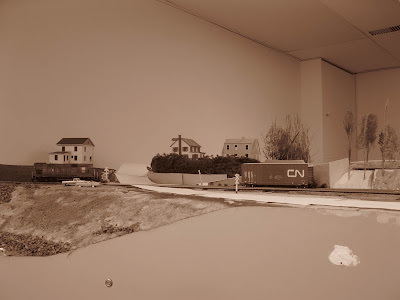 We also came to the conclusion about 3 houses were enough to give an impression the railroad has now reached an urban area. Working with prototype pictures, a few of these houses will be built. 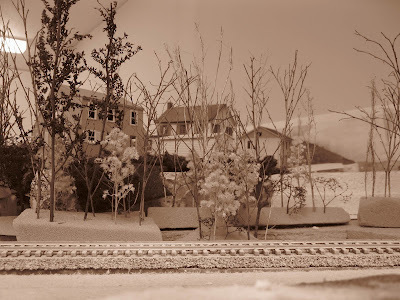 They will also be visible from the other side of the layout, but it won't be a problem since a few houses could be seen from there too. Finally, it was decided the road with the retaining wall wouldn't serve any house so we will have much more space to create the illusion this street is disappearing. One thing we learned from the exercise was to keep visual elements at minimum. Even the treeline will have to be carefully located. If trees are too high, everything looks cramped. Also, color palette will have to remain extremely limited and toned down to not draw attention to individual elements, but rather creates an impression of unity. Houses will be off white and light gray, covered in cheap materials (vinyl imitation clapboard, non-descript PVC and aluminium windows, generic asphalt shingle roofing). 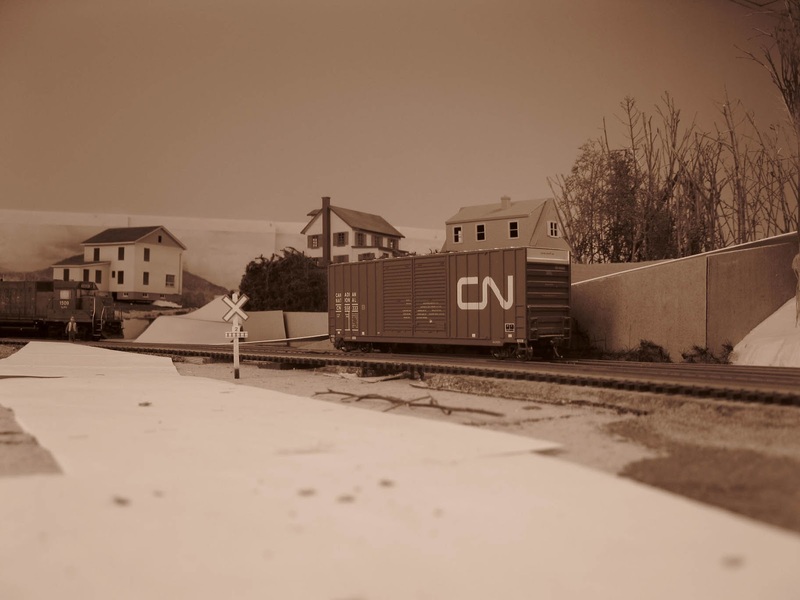 To get a better sense of the results were are looking forward, we shoot mockup pictures using the sepia mode. It really helped to mute the color palette and better analyze how components work together. The new steep road has also help to recreate an iconic real-life railfanning spot on the layout!